Tax season 2018 is finally over and now we can all focus more on how this years’ taxes will be playing out. Hopefully you worked with your tax accountant on your 1st quarter estimates for you business and personal taxes. If you haven’t looked at this yet, I strongly suggest you do so immediately. Please take a look at my past blog articles regarding some key 2018 tax issues at Our Blog when you have some spare time. During January through March, I covered topics such as the Section 199A Deduction, changes to the Alternative Minimum Tax rules, and changes to itemized deductions and exemptions. This week I wanted to focus on a key deduction for many business owners – accelerated depreciation. For those who are unfamiliar with the Section 179 deduction, here is some background for you. The IRS put into place this code section to allow businesses to deduct the full cost of qualifying assets purchased during the year. Qualifying assets include, but are not limited to, machinery & equipment, tangible personal property used in the business, furniture & fixtures, computers, etc. Note that the deduction is limited to your taxable income for the year and any excess can be carried over to the next year. 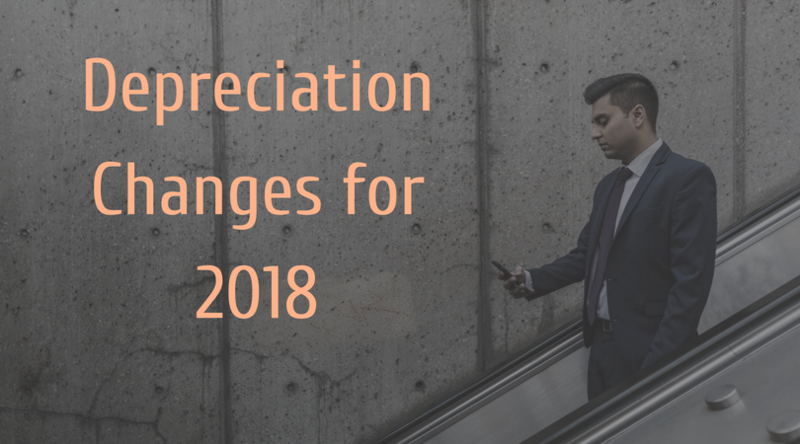 Beginning with the 2018 tax year, the maximum amount of Section 179 accelerated depreciation that can be deducted has been doubled to $1,000,000. Along with this, the phase-out threshold is increased to $2,500,000. On top of this, the list of qualifying assets has been expanded as well. Going forward, Qualified Improvement Property has been added to the definition. This includes any improvement made to the interior of a building (excluded are building enlargements, elevators or escalators, internal structural framework, roofs, HVACs, fire protection systems, and alarm/security systems). Bonus depreciation is another accelerated depreciation method under IRC Section 168(k), that allows for an accelerated depreciation deduction. Previously, the IRS allowed a 50% immediate write-off for Qualified Assets. Qualified Assets were generally assets with MACRS depreciable lives of less than 20 years (ex: machinery & equipment, computers, furniture & fixtures, etc), computer software, and Qualified Improvement Property (see above for the definition). Unlike the 179D deduction, there is no taxable income limitations on the amount of bonus depreciation that can be taken during a particular year. Also, for those in the entertainment business, Qualified Assets now included qualified film, television, and live theatrical productions. Listed Property includes certain passenger automobiles or property used for transportation, property used for entertainment, recreation or amusement (photographic, communication, video-recording equipment, etc), and certain computer and related peripheral equipment. For purposes of this article, we are going to focus on the automobiles/transportation property. Listed passenger automobiles include any four-wheeled vehicle that is used for public streets, roads, and highways and has an unloaded gross vehicle weight rating (“GVWR”) equal to or less than 6,000 pounds. Excluded from this definition are ambulances, hearses, and vehicles used to transport people or property for pay or hire. Even if this threshold is met, transportation property such as certain trucks, boats, buses, airplanes, motorcycles, etc may be Listed Property. There are many inclusions and exceptions under this rule, so please contact your tax advisor to discuss in more detail. It is extremely important for every business to understand the new depreciation laws to accurately calculate estimated tax payments and file accurate tax returns next April. Again, please contact your tax advisor immediately to discuss these changes and how it may impact your business this year and moving forward. As always, feel free to contact me directly to discuss this article!